The Five 더 파이브, based on Korean comics The Five Hearts, is a story of revenge. when a woman Eun Ah (Kim Sun Ah) lost her husband and daughter and was physically and emotionally crippled by a serial killer, she plotted a devious plan and enlisted the aid of four unusual individuals and set the plan in motion. The movie held a VIP screening at the CGV Theater Haengdang-dong, Seoul with all of the main cast in attendance including Kim Sun Ah, Ma Dong Suk, Shin Jung Geun, Lee Chung Ah, Jung In Gi, Park Hyo Joo. Many stars also came and supported the film like, Kim Hyun Joong, CNBlue members Jung Yong Hwa, Lee Jung Shin, 2PM Taecyeon, FTIsland Lee Hongki, MBLAQ Lee Joon, Park Soo Jin, Yoo Yeon Seok and many others. The suspense-thriller movie is written and directed by Jung Yeon Sik and will hit theaters nationwide on November 14th. I am not familiar with the comics but what interests me most is seeing Kim Sun Ah portray such an out of the box character. In this movie she is deglamorized which is an usual thing for me. Most of her usual roles are funny and light (My Name is Kim Sam soon, I Do I Do, Pitch High) In her interviews she said that this role was very challenging for her not only for its physically requirements but also the emotional anguish the character feels is hard to carry. Personally I like actors who are not afraid to look ugly for arts sake. Today at 7pm the press conference for the movie “The Wedding Eve” was held in Gangnam, Seoul Coex Megabox. The cast including the four on-screen couples from the movie, Lee Yeon Hee, Taecyeon, Go Joon Hee, Lee Hee Joon, Ma Dong Seok, Gu Jal, Kim Yoo Jin, Kim Kang Woo and it’s director Hong Ji Young were present. Notably absent from the event and from the past promotional events is Joo Ji Hoon, who was said to be so busy filming the currently airing drama Medical Top Team that he hasn’t been able to join the gang to promote the movie. The responsibility of actors does not stop after filming. It is also part of their job to make sure that people go see your movie. Or why else would you go through all the trouble if not for people to appreciate what you’ve done. But of course, actors are also but human. I’m pretty sure that Joo Ji Hoon would have joined the promos if he could. But sometimes, some actors go out on a limb just to promote their movies. I remember Chinese hunk Huang Xiao Ming, who was then still confined to a wheel chair having broken his toes from filming, up and about, doing the promotional rounds for his movie and even posed for a magazine in that condition! Talk about dedication. The movie’s premise brings to mind the movies Love Actually (2003) or even New Years Eve (2011) in that they are about different couples with different entanglements relayed in a romantic and comedic narrative. The movie will be released November 21. A few days ago, news floated about Shin Min Ah and Jo Jung Suk‘s offer to star in a movie. Both of their agencies revealed then that both actors were positively reviewing the offer. Today, casting of Shin Min Ah and Jo Jung Suk in a remake of Lee Myung Se‘s My Love, My Bride is confirmed. It will be their first time to work together. Jo Jung Suk’s career has been red hot since his star-making turn as a rigid, unwilling romantic soldier in King 2 Hearts. He just came off a very successful and highly rated drama with IU, You’re the best Lee Soon Shin and the box office movie The Face Reader. Shin Min Ah, on the other hand hasn’t starred in a movie since 2009’s A Million. Her last TV drama was last year’s not-so-successful Arang and the Magistrate with Lee Jun Ki. I’m not quite sure about their chemistry since I haven’t seen them in anything together. However, I know for a fact that this movie is a Korean classic so I am curious to see how this classic will fare in a modern setting. My Love, My Bride 나의사랑 나의신부 is a 1990 romantic comedy movie by award winning director Lee Myung Se. It starred the late Choi Jin Sil who got a Grand Bell Awards for best actress for her role. It is a simple story about college sweethearts who got married right after graduation believing that their love can overcome any odds. Pre-production has already begun. Would you just look at how she looks at him? I bet she wants to squeal like a school girl, oh wait, she is a school girl! How old is she again? 15? But this..Aww..is just so adorable! They’re even color coordinated. And I’m not talking about the brother-sister sort. Nope I’m not getting that vibe from this picture or I suppose it’s just me. Today Choi Seung Hyun, Kim Yoo Jung and director Park Shin Woo graced the presentation of their movie Alumni 동창생 at Haeundae Beach amidst a roaring, consisting of mostly young girls, crowd. The three were in high spirits even joking along with the fans.Although the 2 actually play brother and sister in the movie, this didn’t stop the fans from teasing both of them. But they were all game! This is rare for Bigbang’s TOP given his reserved personality. He’s not usually one to play jokes or jest with fans. But he does have those few moments. Kim Yoo Jung on the other hand just blushed and look at TOP adorably. I can’t blame the girl for crushing on him. She has got good taste! Three weeks after it’s opening day, September 11, The Face Reader (관상) has mobilized a crowd of 8,046,362 (based on Korean Film Council data as of September 30) and still counting. The movie attracted 6.35 million moviegoers over the 5-day (from Wednesday to Sunday) Chuseok holidays. It is thus far,only the 3rd movie in South Korea to have done so. In 6 days it overtook the record previously held by The Host (2006) having attracted 6 million viewers. It has also surpassed the 7 million mark only after 13 days beating the record previously set by The Thieves which ended its run at 13 million viewers. With a strong story masterfully woven by director Han Jae Rim about a skilled physiognomist named Nae Kyung (Song Kang Ho) who can judge a person’s character and fate. He travels from the countryside to city in the hope of carving a name for himself. He is then embroiled in a power struggle leading to the revolt of Kim Jong Seo (Baek Yoon Sik), a loyal subject of King Munjong against the power hungry Prince Yoo Sang (Lee Jung Jae). Backed with a star studded cast of Kim Hye Soo, Lee Jong Suk and Jo Jung Suk, the movie has box-office success written all over it. It also proves that the Korean moviegoers love historical movies during the Mid-Atumn Festival (Chuseok) with last year’s “The Masquerade” attracting over 10 million moviegoers. It is only a matter of time whether The Face Reader can duplicate this feat or fall short. Teasers for the upcoming South Korean movie Wedding Eve 결혼전야 or The Night Before the Wedding which stars Joo Ji Hoon, Lee Yeon Hee, 2PM‘s Taecyeon, Kim Kang Woo, Kim Hyo Jin and Go Jun Hee among others have been released today. The movie which will be released in November is a romantic comedy about the lives of 8 normal people and their interlacing entanglements. Lee Yeon Hee (Somi) and Taecyeon (Won Cheol), after 7 years of dating decided to marry finally. But a week before the wedding she accidentally met a webtoon artist, Joo Ji Hoon (Kyung Soo) who brings adventure and fun into her life. So who does she choose? A steady relationship or a thrilling one? Throw in more couples in Kim Kang Won, an ex-baseball player and girlfriend Kim Hyo Jin plus Lee Hee Joon, a urulogist and girlfriend Go Jun Hee, a wedding planner. So which couple will tie the knot in the end? The plot makes for an interesting story for sure. Check out the stills below. No Breathing or 노브레싱 is an upcoming South Korean drama which brings together up and coming young actors Lee Jong Suk and Seo In Guk. Both have become practically overnight stars after each of their dramas became very popular. Seo In Guk starred in the tvN drama Reply 1997 with screen partner Jung Eun Ji whose screen chemistry took the dramaworld by surprise and even got them a popularity award for best couple. Lee Jong Suk on the other hand got noticed in School 2013 for his undeniably cute bromance with Kim Woo Bin (who by the way is also enjoying his newfound popularity and is starring opposite Lee Min Ho and Park Shin Hye in the upcoming drama “Heirs“). But it was not until he starred as a lovable mind reader in I Hear Your Voice 너의 목소리가 들려 which catapulted him to full stardom. 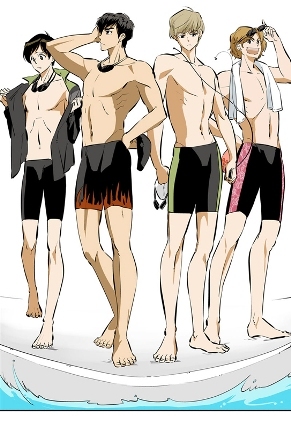 The movie is based on a popular comic book called Flowerboy Swimming Team 꽃미남수영부. LJS plays Woo Sung whose ambition is to become the best swimmer. SIG is Won Il a gifted but hesitant swimming wonder. They are childhood friends but also fierce rivals in sport as well as in love. SNSD’s Kwon Yu Ri is Jung Eun the girl whom they both love. No breathing is a coming of age movie which depicts the struggles of the main characters as they reach for dreams,experience first loves and deal with the hardships that comes with it. The filming took place in Davao in the southern part of the Philippines. It will be released next month in Korean cinemas.